Robbers who stole up to £50m from a Securitas depot in Kent left £1.3m in one of their vehicles. 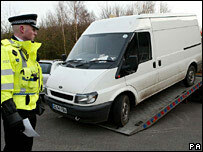 The abandoned Transit van also contained guns, balaclavas and body armour, police have revealed. In a series of armed raids on Sunday, police made a sixth arrest. The man, aged 49, was later released on bail. Officers leading the investigation said on Sunday the robbers were making mistakes because they were under pressure and the net was closing in. All those arrested have now been released on police bail. Earlier on Sunday, police said 14 cages - believed to have been used to transport the cash - were found at Detling, near Maidstone. Assistant Chief Constable Adrian Leppard, of Kent Police, said he was very pleased with how the investigation was progressing. Mr Leppard said police had completed forensic examination at the cash depot in Tonbridge and had handed it back to Securitas. The company has now started its final count of the missing cash which should be completed by Monday. He said the arrest of the 49-year-old man was in connection with the discovery of the Transit van, which was spotted by a member of the public in the car park of the Ashford International Hotel. Police believe the money cages found near Maidstone had been dumped from the back of a white box van at 0930 GMT on Wednesday, just hours after the raid. Mr Leppard said it may be the same Renault lorry that the gang used to move the cash from the depot. Crucially, the lorry has not been located. He added that police had now received more than 1,000 calls with information. Can they launder the money?